Your little one is invited to enjoy a special tea party featuring Abby Cadabby and Zoe from Sesame Street® on Sunday, Jan. 13 at Sesame Street® Safari of FunTM at Busch Gardens®. Tea Party with Abby Cadabby and Zoe at Sesame Street® Safari of FunTM is on Sunday, Jan. 13, 12:30 to 1:30 p.m. Guests will snack on mini assorted sandwiches, veggies with cream cheese and soy butter, fresh fruit, chicken tenders, mac and cheese, mini cupcakes and cookies. And choose from fruit flavored teas as well as milk, juice and hot cocoa. Lunch is $22 for adults and $15 for children. Pass members receive a 10 percent discount. One 6x8 photo is included per family. Admission to the park is not included, but is required. Visit SesameStreetSafariofFun.com or call 1-888-800-5447. 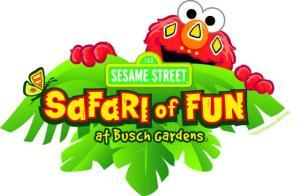 Busch Gardens® has fun for the whole family to enjoy all day. With thrilling rides, award-winning shows and exotic, up-close animal encounters, Busch Gardens® provides unrivaled excitement for guests of every age. Stay tuned for more family fun things to do in Tampa Bay!